Whitworth is sponsoring Cultural Awareness Week Nov. 15-20, featuring Whitworth clubs and community groups representing traditions, beliefs and lifestyles of different cultures. The event will promote learning and understanding of various cultures at Whitworth, in the surrounding community and throughout the world. "Cultural Awareness Week enables our diverse student clubs to invite everyone in the community to learn about and celebrate their cultures," says Cuong Le, cultural events coordinator for the Associated Students of Whitworth University. "I hope people who take part in these events will learn that appreciation for other cultures must be lived out on a daily basis, and that appreciating and understanding our differences can reconcile broken relationships and foster compassion for each other." Monday, Nov. 15: Club de Espanol will host a tamale feed at 5 p.m. in the Hixson Union Building's Multipurpose Room. Monday, Nov. 15: The International Justice Mission club and WISE club will host a lecture by Azra Grudic, an anti-human trafficking specialist for Lutheran Community Services, in Spokane, at 7 p.m. in the HUB's Multipurpose Room. Monday, Nov. 15: A henna tattoo artist will be available in the HUB's Lied Square from 10 a.m.-3 p.m.
Tuesday, Nov. 16: Brant Christopher, a representative with the Not For Sale Campaign, an organization dedicated to eradicating human trafficking, will present two workshops for students. The first, "Slavery Map 101," will be at 11:45 a.m. in the Science Auditorium. The second, "Supply Chain 101," will be in Weyerhaeuser Hall's Room 111 at 4 p.m. The workshops are sponsored in part by the IJM club. Tuesday, Nov. 16: A faculty panel discussion about Arizona's immigration laws and historic parallels will take place in the HUB's Multipurpose Room at 7 p.m.
Wednesday, Nov. 17: Whitworth, in conjunction with the IJM club, will host a keynote presentation by the Not For Sale Campaign's president, David Batstone, and World Champion San Francisco Giants pitcher Jeremy Affeldt, who is involved with Not For Sale, at 7 p.m. in Weyerhaeuser Hall's Robinson Teaching Theatre. Following the presentation, Batstone and Affeldt will be available to talk with students during Duvall Hall's Prime Time at 9 p.m.
Wednesday, Nov. 17: The Bon Voyage Theme House will host an Egyptian-style dinner at 7 p.m.
Thursday, Nov. 18: The Black Student Union will host a performance by slam poet Laura Piece, at 7 p.m. in the HUB Multipurpose Room. 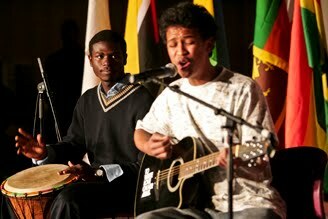 Friday, Nov. 19: International Banquet, "I-Club Got Talent," sponsored by the Whitworth International Club. A buffet dinner will be served at 5:30 p.m. in the Whitworth University Dining Hall. The dinner will feature an array of specialty foods from countries around the world. An international fashion show and entertainment program will start at 7 p.m. and will feature Whitworth students and groups from the Spokane community. Tickets for the banquet are $20 general admission; $10 for students. Tickets can be purchased prior to the event by calling the Whitworth University Information Desk in the HUB at (509) 777-3796. Tickets can also be purchased at the door. Saturday, Nov. 20: A Black Student Union-sponsored dance, "This is How We Do It," at 9 p.m. in Baldwin-Jenkins Hall. Cuong Le, ASWU cultural events coordinator, Whitworth University, (509) 777-4790 or cle12@my.whitworth.edu.